There are only a few stories of legends that came back to life. 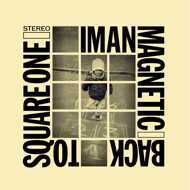 We’re proud and happy to announce that we brought back the producer Iman Magnetic from the legendary 90’s hip hop group Square One! Iman's beats are a breathtaking timewarp into the history of hip hop and will remember you of the times when this cultural movement first started. Press play and think of Patty Astor, Keith Haring, Manuel Gerullis, Pete Rock, Wu Tang and Rasul Allah (RIP).